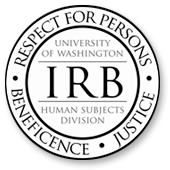 Wednesday, Feb. 6, 2019, 12:30 – 4 p.m.
For new and experienced investigators, including students and faculty, who plan to perform research that will include human subjects, IRB 101 will provide an overview of human research requirements, the IRB review process, common issues with IRB applications, and important information about recent changes to the regulations that govern research with human subjects. 1:30 – 4pm: One-on-one consultations will be available in 20 minute increments following the presentation for questions about IRB submissions and the review process. If you’d like to schedule a consultation, please email Dawn Moncalieri at dawn3@uw.edu.